Nature Therapy is a research-based framework for supporting healing and wellness developed by the Association of Nature and Forest Therapy Guides and Programs. Nature therapy has been inspired by the traditional Japanese practice of Shinrin-Yoku (or forest bathing). It is the simple practice of taking a slow mindful walk in nature, igniting all of your senses to engage with your surroundings. The practice recognises that nature is good for us and contributes to good health and well-being by restoring the nervous system. Rejuvenating for body, mind and spirit, nature provides the medicine for your healing journey. Nature Therapy walks generally run for 2-3 hours and cover no more than 1 kilometre. After an initial welcome and orientation to place, the Guide encourages mindfulness through an evolving series of suggested invitations to help you connect with the more-than-human world around you. Each invitation is crafted to help you slow down and open up all your senses (much more than the five we know well). Using an ancient practice of Council, we have opportunities for listening and being listened to in our collective experience of nature. Nature Therapy benefits people of all ages and stages in life. It is a practice that enhances other aspects of your life such as relationships, self awareness and mental health. Private walks can be arranged specifically for corporate groups, friends, family, colleagues, clients and community groups or you can join a public walk to meet new people. See our Corporate Wellbeing Services to discuss walk options for your workplace. For Aboriginal people, the land is full of stories, healing practices and lessons for living. The practice of dadirri goes to the heart of what it means to be connected spiritually to the country, being in nature and listening to the rhythm of the land. Elder, Miriam-Rose Ungurmurr says resting in quiet still awareness allows us to deeply contemplate this connection, to know and discover who we really are, who we are connected to, and our ancestor’s journeys that have led us here. So unique and sacred is the connection to country, that Aboriginal people become sick physically and emotionally, if away from their homelands for extended periods. Loss of connection to land through colonisation has disrupted the spiritual relationships of communities and peoples, resulting in a loss of identity and spiritual wellbeing. The land itself has also suffered the loss of a caretaker for its country. ‘(re)connect, slow down, listen and just be’. There is a lot of emerging scientific evidence about the health effects of being in the forest. Simply being in the wilderness has been shown to increase immune function, reduce blood pressure and rates of cardiovascular and respiratory disease, reduce stress and prevent psychosocial stress related illness, improve mood and thinking, increase focus and concentration, improve mental performance and creativity, improve rates of recovery from surgery and illness, increase energy and improve sleep. If you love the science, click here for references. Research on forest bathing in Japan has demonstrated that the chemical that evergreen trees emit to protect themselves from germs and pests is the same essential oil that improves the human immune system. They are called phytoncides and they produce cancer-fighting natural killer (NK) cells in our body. Being in nature has other benefits too like developing a mutually respectful relationship with the earth, deepening our practice of earth care, fair share and place tending. The gifts of awe and wonder emerge as your intuitive skills to communicate with the more-than-human world become finely tuned. People on regular forest therapy walks report feeling happier, developing deeper more meaningful relationships, feeling more connected with the land and its species, having more energy and developing a more attuned intuition. So what are you waiting for? Turn your screen off and get out there! The founder of NFT says “Like yoga, meditation, prayer, working out, and many other worthy endeavors, shinrin-yoku is a practice. And because it is a practice, it is best to learn it from a qualified guide.” Some people just need that extra bit of motivation to get outside and give themselves permission to relax. Consider the guide just as important as a personal trainer or fitness coach, to strengthen your whole mind, spirit and body. But I don’t need ‘therapy’? Some people can be put off by the word ‘therapy’ because it implies we will be ‘doing’ something to you. Nature therapy is an experience you can choose to enjoy at your pace in your way. It’s less about ‘doing’ and more about ‘being’ your true nature. Nature is the therapist, the guide just opens the door. What have others said about our Nature Therapy Walks? “This experience delivered most unexpected results. I didn’t think I had anything that needed healing, but the centreing experience of slowing down and blending my conscious with that of the forest, has definitely left me feeling so at peace”. Read more Recommendations from past participants. Download our brochures to share with friends, colleagues or your employer. We schedule public walks throughout the year which anyone can book into, often for special diary events such as Mental Health Week and environmental celebration days. With a maximum of 10 people, these are a great way to share an experience with people in your community. Cost from $40 (adult), $20 concession (student or health care card). Join Our Newsletter to hear about upcoming public walks or keep an eye on our Facebook page events. 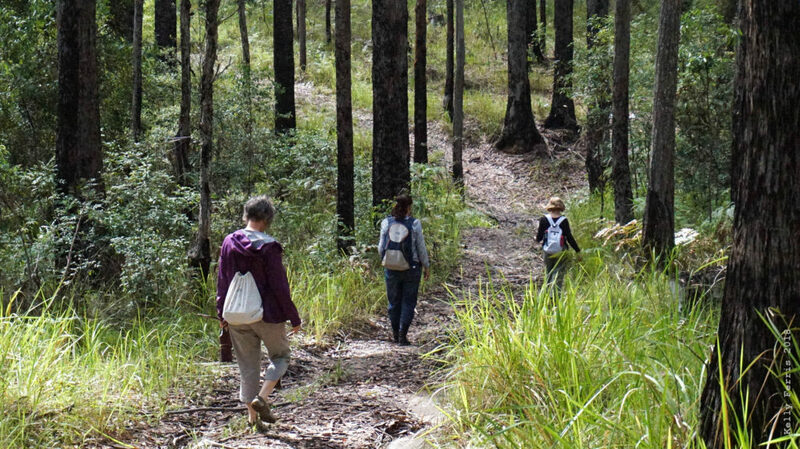 Our Upcoming walks include: The Magic of Stillness – Nature and Forest Therapy Walk, Coffs Harbour region, April 13. A private walk is ideal for couples, families, groups of friends, visitors and tourists. Birthday parties, girlfriend dates, a romantic afternoon or to discover a unique place in the Coffs Coast/Nambucca Valley region. These are some of the reasons people choose to book a private walk. We can tailor-make a walk, on a day and time that suits your needs. Solo private walk – $150. Couples private walk – $150. Small group 3-4 people – $55 per person. Small group 6-8 people – $50 per person. Small group 9-12 people – $35 per person. Concession price available on request. Contact Us to book and discuss your needs. Ideal for aged care homes, hospitals, schools, youth groups, mental health services and much more. We can tailor-make a walk for your client group needs, even if they are contained to the indoors. Contact Us to discuss your needs and for a quote. Go to Corporate Wellbeing Services or Contact Us for a quote and to discuss your needs. See you soon in nature. *Milroy, G & J. in Morgan in Heartsick for Country, eds. Tjalamiu, M., & Kwaymullina, B. & Kwaymullina, B. The Association of Nature and Forest Therapy California.